Durham is about to get it’s first very own micro-distillery! Initially planning to produce around 10000L/12000 bottles of ‘premium’ Durham Gin at his Langley Park site by Christmas this year, Jon Chadwick is hoping to eventually expand these quantities as well as stepping into vodka and whisky production too! The growth of micro-breweries across the UK and the success of the USA’s small scale bourbon production helped convince Jon to push ahead. 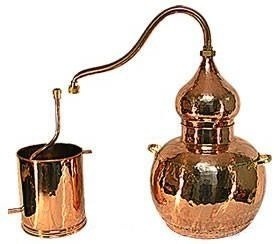 Using a Spanish handmade 400L alembic copper still, the current ‘one man’ operation at Durham Distillery will be aiming to create small batch craft Gin around 42.5% abv which will be available to buy on-line as well as being locally supplied. If the micro-distillery proves successful, his plan is to move it to Durham City and create a visitor attraction. We wish him well!